Let me just start off by saying that I have never seen the movie American Psycho. Nor have I read the 1991 novel by Bret Easton Ellis. That doesn't however mean that I am not looking forward to it's upcoming Broadway production. First of all it has a score by Tony winner Duncan Sheik. You might recall he had a hit almost a decade ago with Spring Awakening. That production went on to win eight 2007 Tony Awards, including Best Musical of the Year, and is being revived this September. But enough about Spring Awakening. This blog is about American Psycho. So let's get right to it shall we? Set in the 1980's, American Psycho is about a young investment banker from the Upper West Side by the name of Patrick Bateman. Oh and when he's not making a killing on Wall Street, he's killing everyone from colleagues, to prostitutes, to the homeless. Sounds like the next great musical comedy to me. I'm joking. Playing the part of the wealthy serial killer is Benjamin Walker, who's most recent credit's include the revival of Cat On A Hot Tin Roof, as well at the title role in Bloody Bloody Andrew Jackson. Having seen both productions I have no doubt he is up for the challenge. Dare I say he will be slaying them in the aisles? I know. I know. Too much right? Previews for the show are set to begin on March 24, 2016 at a Shubert Theatre to be announced. Now while no on sale date has been announced, I'm sure that when it does it is going to be one hot ticket. 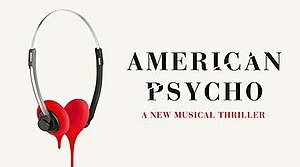 Get your tickets to see American Psycho on Broadway. Until next time theatre fans.